I guess Kenny’s zipper didn’t have the tensile strength to hold back the sheer force of his manaconda. It ended up blowing out, so before heading out for the day, we had to make a pitstop at Cyclegear to get him a new pair of pants. Our first leg of the day took us to Caliente Bodfish Road heading towards Lake Isabella. It was a beautiful rural road that carved it’s way through dry, golden sand hills. 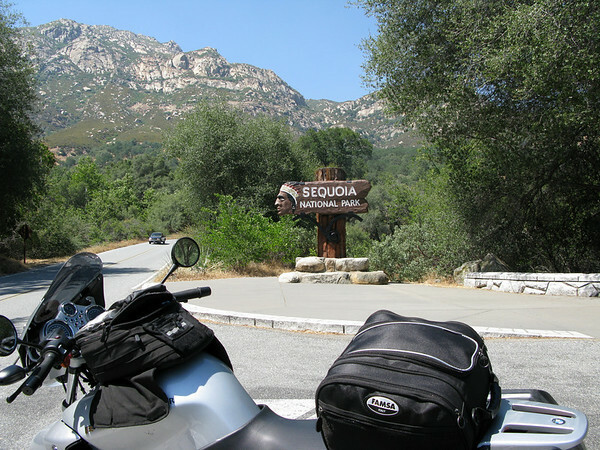 As we came down out of the hills, we passed through Lake Isabella on our way towards Sequoia National Park. As we entered the park, I kept looking at the trees and thinking, ‘Yea, they are pretty big.’ It isn’t until you enter the Giant Forest until you really begin to get an understanding of just what a BIG tree is. If you’ve never seen a giant Sequoia, you have no frame of reference of what to expect. Photos and video could never do justice the feeling of being amongst them. If a tree is worthy of a name like General Sherman or Sentinel, it’s pretty special. We spent some time in the park, checking out the trees and just lallygagging. We rode north until the sun was just about down and found ourselves in a pinch between national parks on the weekend. EVERYTHING was booked. Except one place. It was the worst motel I’ve stayed in to date. Beggars can’t be choosers so we shacked up at the South Fork motel in North Fork. Uniroyal Gal Awesomeness: Nitro Girl!